Booth will take a one-point lead into the final programme of the Spenser Wilson Halifax League season next Saturday. Richard Laycock’s side, bidding for a hat-trick of titles, having remarkably wiped out Thornton’s 15 point advantage over the last two Saturdays. After pulling back six points the previous weekend, when Thornton fell victim to Christian Silkstone’s record-breaking knock of 316 at Triangle, Booth took 12 points to Thornton’s two yesterday when they beat visitors Bridgeholme in the only top-section match to beat the weather. After heavy and persistent rain during the first half of the afternoon, a 25 overs per side match started at 4.15. Moazzam Ayub, rated Booth’s most accurate bowler, took 7-39 and Patrick Thomas picked up the other three wickets in one over as the bottom club were rolled over for 95 in 20.1 overs. The stumps were hit nine times and the other wickets was an lbw with Thomas Durham (30) and Sohail Sajjid (26) heading the resistance. Booth then knocked off the runs for two down in only nine overs with the Laycock brothers unbeaten, Robert on 27 and Richard on 25. They had needed maximum points to edge ahead of Thornton, who have more 12-point wins in 2018. It must have been painful watching for some Thornton players, who had made the trip to Broad Fold Park after their home game against Sowerby St Peter’s had been called off. Booth may have hit the front but it is far from a formality that they will plunder the league’s biggest prize after what had promised to be a barren season. They must go to third-placed Triangle next Saturday while Thornton are away to Southowram, whose return to the middle section was confirmed by yesterday’s cancellations. Richard Laycock admitted his side had got lucky with the weather but said that his club had invested time and money into improving the drainage at their ground and there had been no doubt about the fitness of the pitch at 4.15. Laycock said: “At 2.30 there looked to be no chance of us playing. It was very wet and there were puddles so we played cards for an hour. “At 3.30 it was raining less and some of the wet areas had drained. Peter Taylor (umpire and former league official) said we needed to toss up by 4pm and if it was fit we could play. Laycock had sympathy with Thornton but said Booth had been on the wrong end of a similar situation in the past. “A few years ago we had to watch Warley win the league when we were off at Booth because it was too wet. Booth were due to have several players missing next Saturday but with everything to play for, Laycock is hoping some team members may re-arrange their plans. Only one other game took place in the entire league yesterday and that was also a significant one with Upper Hopton firsts beating Cullingworth by nine wickets in Division Two to leap-frog Luddenden Foot into the second promotion place behind Mount. Matt Broadbent and Jack Stephenson took three wickets each as rock bottom Cullingworth were limited to 60-6 off 26 overs. Hopton lost Matthew Haigh for a duck but Ian Wightman (43 no) and Martin Daniel (15 no) knocked off the runs in 12 overs. Mount (199 points) are champions in their second season of Halifax League cricket. Upper Hopton have 186 points and Foot 180 ahead of their final games at home to Leymoor and away to Low Moor HT respectively. 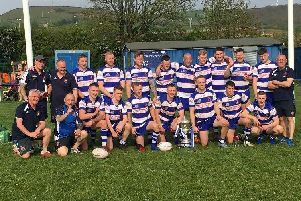 Division One teams finished their programmes yesterday and the washout confirmed Illingworth St Mary’s as champions and Sowerby Bridge as runners-up. Queensbury and Stones had already been relegated.